Manchester United midfielder Michael Carrick has told the club he will take up their offer of a first-team coaching role at the end of the season, according to manager Jose Mourinho. 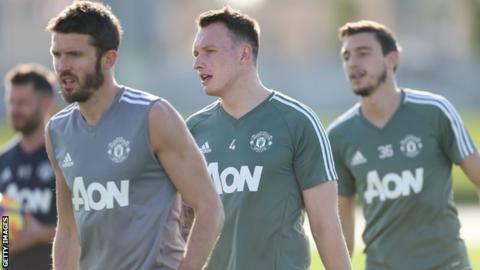 Carrick, 36, has not played since experiencing an irregular heart rhythm in September, but he began training again in November following treatment. "The club would be very happy for him to do that. I would be very happy also for him to do that," Mourinho said. "I expect him to join," he added. "[He had] a few months without even training so now he is in his second week of training with the team. He is a very important player for us. "I think it is a good decision for the team and a good decision for him to finish playing football and not injured or with some problem." Carrick, who has 34 England caps, had a treatment called a cardiac ablation after "feeling strange" during the second half of a 4-1 EFL Cup victory over Burton on 20 September - his only appearance of the season. The British Heart Foundation says an ablation is a treatment that aims to control or correct certain types of abnormal heart rhythms. Carrick joined Manchester United from Tottenham in 2006 and has won five Premier League titles, the Champions League, Europa League and Fifa Club World Cup with the club.